CHULA VISTA — After more than a decade of joint planning efforts between the Port of San Diego and the city of Chula Vista, the California Coastal Commission signed off on the 556-acre Chula Vista Master Plan at its Aug. 9 meeting. The approval sets the stage for development of one of California’s last parcels of undeveloped waterfront land, and one of the largest. Moving forward, port and city officials will be working to find a developer for the master-planned project, which is slated to include a resort hotel and conference center, condominiums, shopping centers and mixed-use recreation areas. More than 240 acres of the project are to be used for park area and as open space reserves. Costing an estimated $1.5 to $2 billion to implement over the next 20 years, the Chula Vista Bayfront Master Plan is expected to create 7,000 construction jobs, 2,200 permanent jobs and generate a projected $178 million in revenue for the city and the port. The project will be implemented in four major phases over a 24-year period, with the first phase to include the development of the resort conference center, creating public parks and open space, restoring habitat areas and constructing a new fire station, RV park and mixed-use residential development. Construction on the first phase could start by 2016. Originally, the port had proposed adding several new commercial recreation projects to the bayfront master plan in the area currently occupied by the Marine Group Boat Works shipyard. The projects planned included a community boating center and yacht club, and a new 200-slip recreational marina. However, while San Diego’s Port Master Plan requires that the boatyard’s relocation site be determined prior to redevelopment of the site, the boatyard is expected to remain in operation for at least another decade at its current location. With Marine Group Boat Works staying put, the port decided to remove plans for the boating center, a new recreational marina next to the boating center and the removal of 200 slips from the existing Chula Vista Marina from the project list. 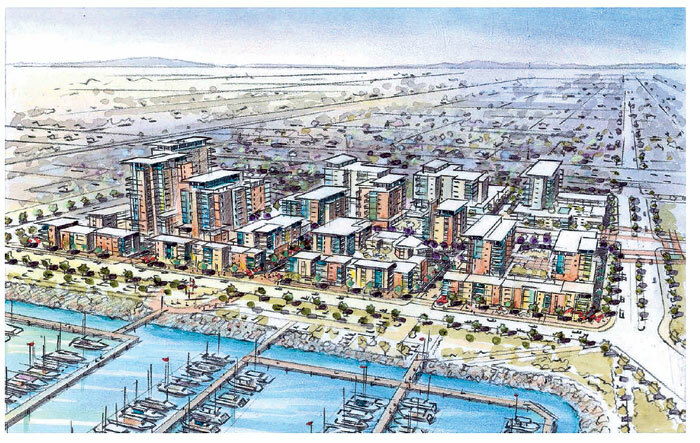 The San Diego-based development and real estate firm Pacifica Companies will design and construct the mixed-use residential areas located adjacent to Chula Vista Marina. While construction on the Chula Vista Bayfront Master Plan is still a few years away, Chula Vista and port officials have been working on clearing the way for the projects, working this year on demolishing the area’s decommissioned power plant. The South Bay Power Plant, on Chula Vista’s waterfront just south of the marina, is scheduled to be imploded in two phases, cleaning up the bayfront while improving views of San Diego Bay. The plant began operations in 1960 and was decommissioned in 2011.